Butternut squash is one of my favorite ingredients to work with during the fall and winter because it just exudes a sweet, hearty, warmth. When it’s roasted, all the sugars caramelize and the flavor of the squash is intensified. Pair it with the other star ingredient in this dish, the aged Gouda, and we have ourselves a sweet-and-savory home run! 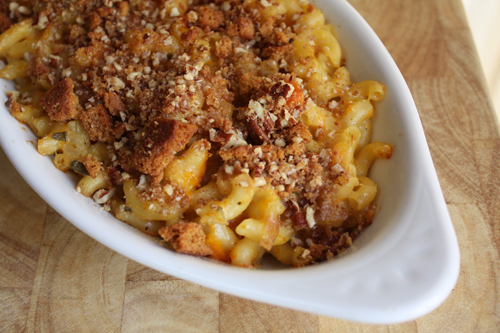 The technique to making this dish is pretty standard as far as mac and cheese goes. After sautéing the onions and sage, a roux is made with flour, chicken stock, and milk. Then the squash is added to the mix and smashed in a bit to fully incorporate. 1. Preheat the oven to 450°F. Toss the squash with olive oil, salt and pepper to season. Roast on a foil-lined baking sheet for 20-25 minutes until lightly browned. Set aside and turn the oven down to 350 degrees. 2. Bring a large pot of salted water to a boil. Add macaroni and cook until al dente according to the package instructions, about 8 minutes. 3. While the pasta cooks, heat a large pan over medium heat. Add the butter, chopped onion, and sage. Saute about 4-5 minutes until onions are translucent. Add the flour and stir to combine. Let the mixture cook for 1-2 more minutes. Whisk in stock and milk, and let come to a boil to thicken up. 4. Next, add the cheeses, mustard, nutmeg, and cayenne. Stir to combine. Then, mix in the squash. Use a whisk to mash-up the squash a little. I prefer to leave a few chunky pieces of the squash in the sauce. Add salt and pepper to taste. 5. Drain the cooked pasta and return it to the pot. Pour the sauce over the pasta and combine well. Pour the mac n cheese into a buttered casserole dish. Sprinkle the gingersnap cookie crumble and pecans over the top and drizzle with a little olive oil. 6. Cover with foil and bake 20 minutes. Remove foil and continue baking until lightly browned on top, about 30 minutes more. I may not be able to jet-set to Italy whenever I get the craving for some tortelli lovin’, but that doesn’t mean I can’t get my fix of pumpkin and spice and everything nice! Surprise your guests with this dish this winter. The presentation is beautiful and homey, and one bite will have them coming for more. Enjoy!! This entry was posted on July 6, 2010 at 7:03 am and is filed under Cooking, Family, Friends, Random, Recipe. You can follow any responses to this entry through the RSS 2.0 feed. You can leave a response, or trackback from your own site. 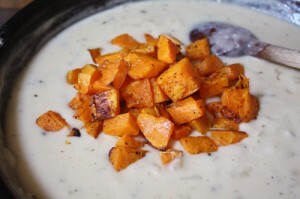 I love butternut squash and this recipe looks heavenly…what a great comfort food! With winter down there your recipes are almost having me wish for fall…almost, but not quite…I think I want to have summer here first! Your recipes and photos are so good – and for some reason they always find me just as I check my e-mails before making supper. Now I’m REALLY HUNGRY. I too am in the midst of summer, but I’m pretty sure our local store has it – they probably import it from you guys. I’ll just have to try this out for tomorrow night’s supper. Thanks! Oh my God, this sounds so wonderful. They have me on a liquid diet for two weeks after surgery. Yuk! As soon as I can have other stuff, this is the first thing I’m going to make. The gouda is a refreshing change. Squash – any kind is always great – and the topping is so very original. Yum! … Off now to have my drink . . . Phew! Thanks for the great post and something to look forward to. I think folks will enjoy and hope you net a new reader or two out of it. Appreciate your willingness to share. I really, really enjoyed it as a memorable first day on solids. Hooray!